Out of sight, out of mind — after the two world wars, huge quantities of munition were simply dumped in the Baltic Sea. In some cases not very far from the coast. At that time there was no concern that these legacies would become a dangerous threat sooner or later. In German waters alone, the quantity of conventional munition and chemical warfare agents is estimated at 300,000 tons. 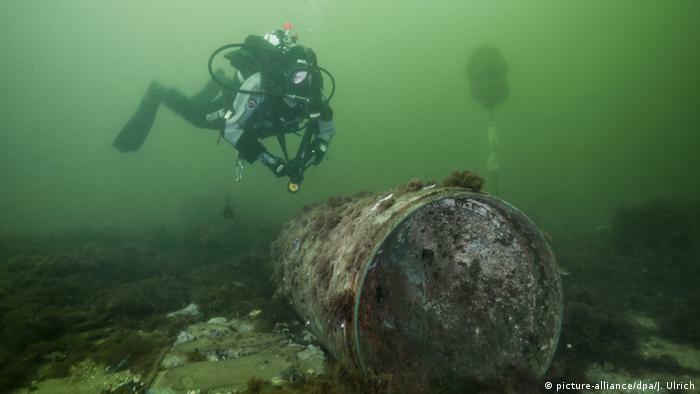 For example, the Kolberger Heide munitions dumping area is located directly outside Kiel – a restricted area in which around 35,000 tons of sea mines and torpedoes are located at a maximum depth of twelve metres and within sight of the beach. What is to be done with the contaminated sites? Do you leave them there and accept that toxic substances slowly escape, or do you hide the munition and risk that the porous metal bodies break or even explode? These questions need to be answered quickly, especially if, for example, a submarine cable or pipeline is to be laid or a wind farm built in the areas. In the international research project DAIMON (Decision Aid for Marine Munitions), scientists have developed decision-making aids and presented them at the joint final conference of the Thünen Institute and Alfred Wegner Institute for Polar and Marine Research in Bremerhaven. The aim is to provide the authorities and politicians with practical and directly applicable recommendations for environmental monitoring and munition handling. With great effort, the researchers obtained samples and analysed the chemicals escaping from the munition bodies. Traces of the munition were found in fish from dumping areas. This applies equally to degrading products of the explosive TNT and to chemical warfare agents containing arsenic. Mussels that were exposed to the influence of munition in small net cages in the Kolberger Heide enriched TNT degradation products, making it more potent. It is therefore clear that toxic substances escape from the bombs and are absorbed by the organisms living there. The team also found that TNT is toxic to mussels and damages the genetic material of fish, which can lead to tumors. The sensitive flatfish species dab actually has more liver tumors in the Kolberger Heide munitions dumping area than anywhere else. A connection between the local TNT load and an increased tumor rate is obvious, the explanation said. The degrading TNT products are also genetically harmful, so that the organisms are still exposed to the effect of the munition even if the rapidly degrading TNT is no longer detectable.